Grilled fish, white meats, cheeses and filled pasta. 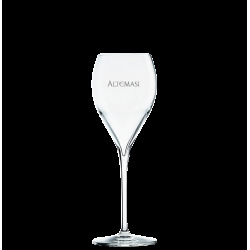 The very first Altemasi label created in 1993, the top sparkling wine of the winery. This Traditional Method lays down on the yeasts for more than 60 months and it's a very small production made only in the best vintages. The name comes from the Holy Grail legend, from medieval latin gradalis "cup, goblet", which is perfect to express its finess on the palate enhancing the complex bouquet. White foam with fine and consistent perlage. Straw-yellow colour with greenish tinges. Intense and complex aroma with apple and citrus notes accompanied by hints of minerals, candied fruit and pastries. Crisp, well-balanced palate. Significant levels of acidity enhance the fabric and backbone that support the elegant minerality and long persistence. The most suitable highest hills for the cultivation of grapes for sparkling wine in Trentino (the hills around Trento, the Brentonico Plateau and Valle dei Laghi). Grapes grown on loose, generally shallow, glacial and volcanic soils at altitudes of 500 to 600 meters above the sea level.